High in the mountains of Sierra de las Nieves natural park in the South of Spain, one Spanish fir tree (abies pinsapo) towers above its kin. They are known for their unusual appearance, since their thick needles grow radially around their shoots, resembling furry little fingers. Their color is also striking, as it is a pale blue-green, similar to an artificial Christmas tree. 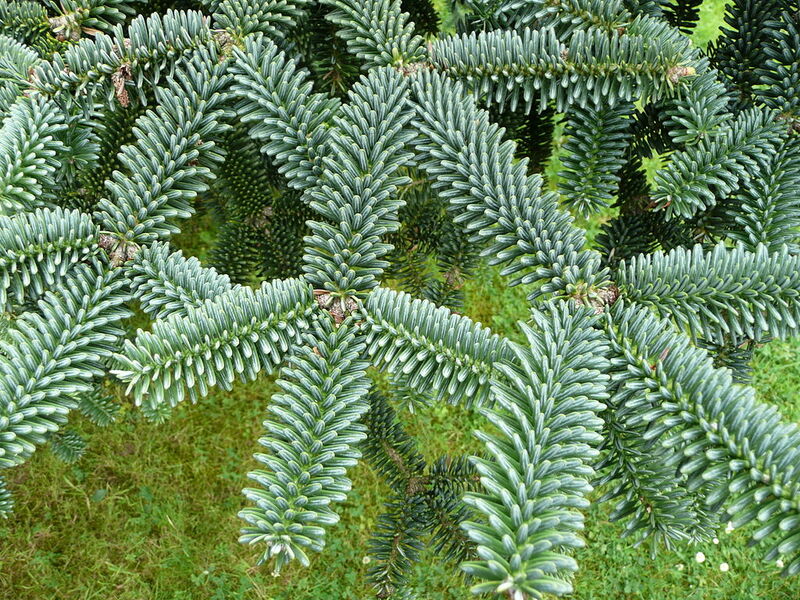 This has made them popular in modern times as a decorative tree, and they appear in botanical gardens around the world. 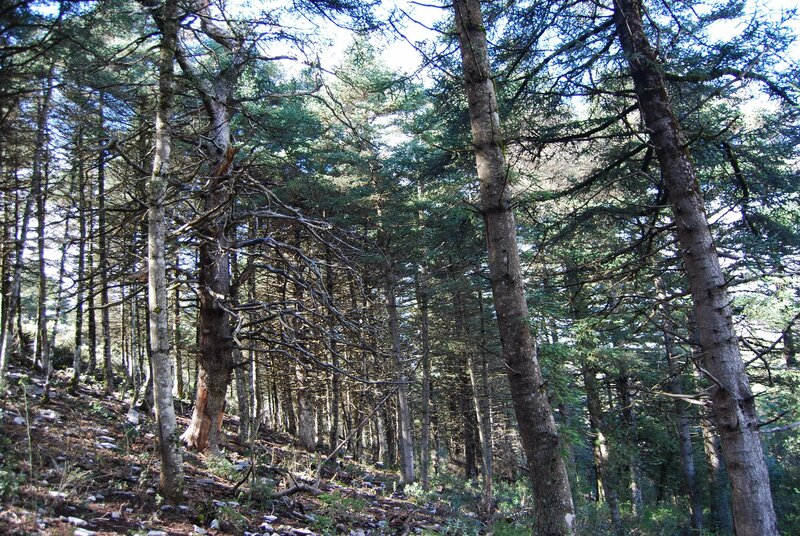 Spanish fir trees in nature are quite rare, and listed as vulnerable by the International Union for Conservation of Nature. Growing almost exclusively in the Serrania de Ronda mountain range, the survival of the species was a stroke of good luck. The species originates more than 20 million years ago – predating the Ice Age. As glacial ice covered the Iberian Peninsula, the native habitat of the pinsapo was protected from freeze over by the surrounding mountains. These mountains continue to protect the forest today. Standing out in the dense fir forest is the Pinsapo de las Escaleretas. At 26 meters (85 feet) tall, its long branches are far too heavy to extend straight outward like they would in a younger tree. 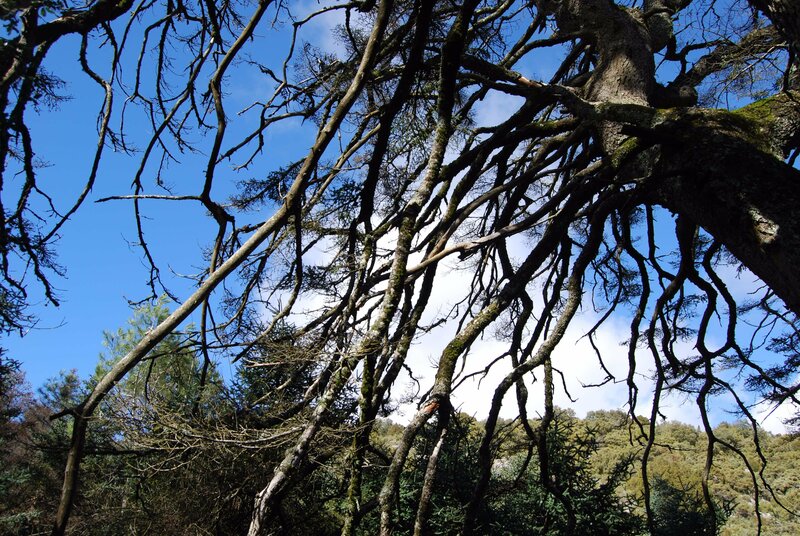 Although it’s an evergreen, many of the lower branches are bare. It is the oldest of its species in existence, well past the average life span of 200 years. Its exact age is not known, but it is estimated to be between 350 and 550 years old. Indeed, it’s nearing the end of its life cycle. However, this mother fir tree still contributes to the survival of its species. The term ‘mother tree’ is more than just a metaphor. When Canadian ecologist Suzanne Simard took a deep look into the soil of a forest, she found countless tiny threads running between each of the trees. Older and larger trees have the most links, and are called hub or mother trees. These threads are a kind of fungus called mycelium, and they allow individual trees to pass nutrients between each other. Not only can they help weakened trees recover by transferring carbon, nitrogen, water, phosphorous, etc., they can also send information. When one tree is under threat, it will send a chemical message through the network to all of the other trees in the forest to get ready. For example, if a beetle invades a forest, the first trees infected will spread the word, and other trees will begin producing repulsive chemicals. Additionally, when a tree is dying, it will dump its carbon into the fungal system, so that even if it doesn’t survive, the rest of the forest will. The Pinsapo de las Escaleretas is likely in the middle of this process. But there is one more reason why it should be called a mother tree. As Simard studied the transferring of nutrients, she discovered something incredible about how it is distributed. So we set about an experiment, and we grew mother trees with kin and stranger’s seedlings. And it turns out they do recognize their kin. Mother trees colonize their kin with bigger (fungal) networks. They send them more carbon below ground. They even reduce their own root competition to make elbow room for their kids. The mother tree not only produces seeds, but also nurtures its own growing offspring. The Pinsapo de las Escaleretas has a lot of mouths to feed. 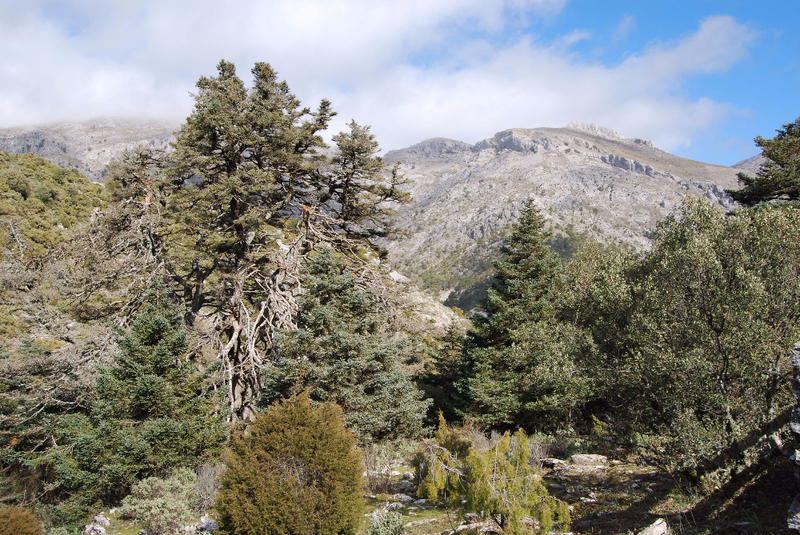 50 years ago, the Spanish Fir inhabited only 700 hectares (1700 acres), but thanks to conservation efforts it’s now up to more than 5000 hectares (12000 acres). Ancient trees are invaluable for a number of reasons, but they also play a critical role in the health of younger trees in a forest. Their gnarled appearance adds to their magnificence, but their truly marvelous achievements are deep underground, hidden from the naked eye. If you enjoyed this article about el Pinsapo de las Escaleretas, check out the archive for more tree stories. Also check out the Facebook page, with a few extra tree goodies throughout the week. Subscribe below to receive notifications whenever a new tree story is published. Fascinating stuff! Supports my thoughts of “trees are people too”. Look forward to reading more. Nice! Thanks for the recommendation. I have one of a similar title written by David Suzuki. I found the way it was written to be a bit difficult to get into which was disappointing because it’s one of my favorite topics. I haven’t read the book, but it was an international best seller, so that must count for something! I LOVE that book and highly recommend it!!!!! The book book does sound a lot like this blog entry. Thanks for the links at to check out. Just so fascinating! I really hope that everyone will take the time to watch the TED talk! I have a Spanish fir tree in my own house. Well it’s planted in a pot. Thank you! Spanish Fir trees are one of my favorite types of tree! Such an unusual shape. I hope you enjoy it! This is wonderful knowledge. Keep it up. I’d love to hear more. With unfailing regularity, nature provides us with a very gentle model of how we should care for each other; recognising that in caring for all, we care for ourselves best. Clonal trees are definitely something I will touch on in a future post. Super interesting stuff. I absolutely agree. I hope I can motivate even just a few people to look to trees for inspiration. Looks awesome! I’ll have to spend more time on your site. I’ve been getting into bonsai recently. You ever shoot small trees? Do you mean write about small trees? I have a couple of smaller trees that I want to write about, but I can’t say when I’ll get around to them. I’m also a big fan of bonsais! Yeah, I just didn’t know if you ever wrote on bonsai. But keep up the good work! Yours is certainly a unique blog! Enjoying your blog. Shared on Facebook and sent link to tree surgeon/artist friend. Also Edinburgh, Spain and Kent in common! Thank you, Tamsin. Small world, isn’t it? I’ve been in Spain for more than 2 years now, but I haven’t had the chance to do the Camino de Santiago yet. I look forward to reading about your journey! Until now, I considered the Banyan tree the most ‘rooted’ tree – with its ability to generate daughter trees using aerial prop roots. After reading your article, it looks like Banyan trees are no match to Spanish fir trees – with the huge number of fungal networks they maintain and use. Glad you enjoyed it! However, many types of trees have these fungal (mycorrhizal) networks, including Banyan trees! Something like 95% of all plant life takes advantage of these networks somehow. Pretty cool stuff. Well, didn’t know about that before. Thanks for briefing me on the same. P.S. : Could you please write an article about Banyan trees? Looking forward to it, Nick! Finally someone writing about trees! They’re among the most overlooked creatures in our everyday lives.. Thanks for the kind words. I try to add a new tree at least once a week. I live in Estepona at the foot of Sierra Bermeja and we have the lovely Pinsapos here too . It’s so beautiful on a lovely day, Treeographer.